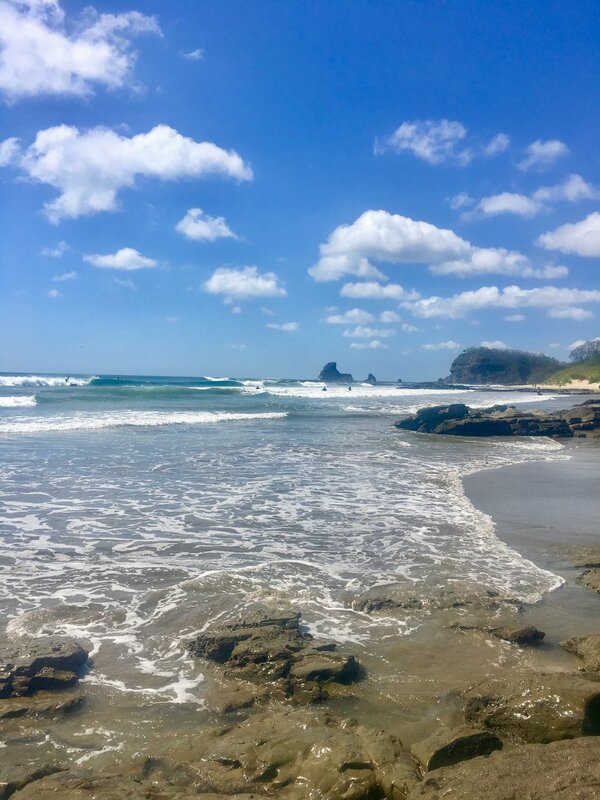 Nicaragua—sun, sand, and…well to be honest, we weren't sure what to expect from the Central American country nestled between Costa Rica and Honduras. The five-hour flight from DC > Miami > Managua (Nicaragua’s capital city) was a breeze. Customs requires a $10 cash payment, and with that we were in! At the time, Adam's sister, Allison, was living in Granada and we were excited to visit her and explore what has undoubtedly become one of our favorite countries we've visited to date. 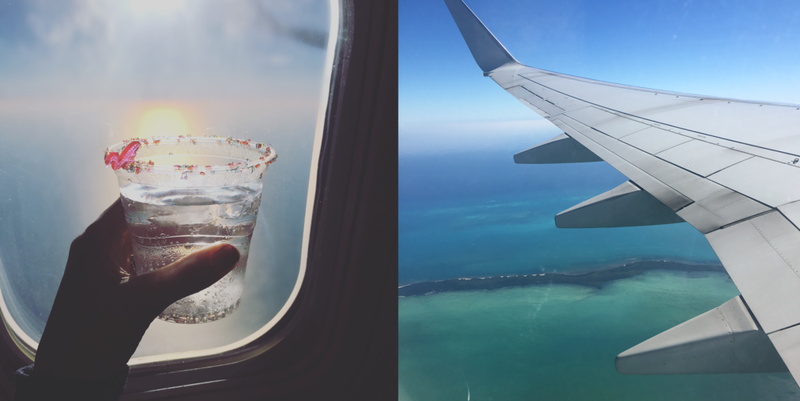 We're already wanting to go back. 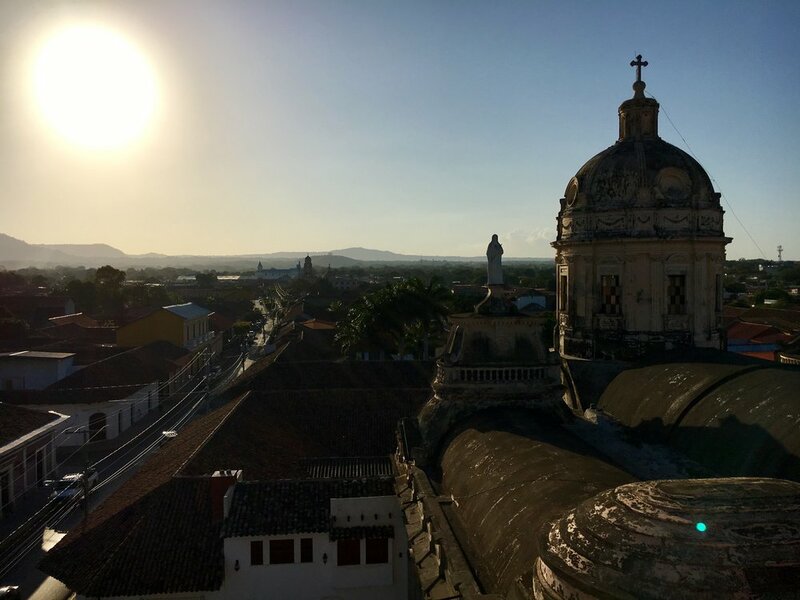 Check out this fun video of our trip and details about some of our favorite spots in Granada and San Juan below. Obviously, safety is always top of mind when we're traveling. 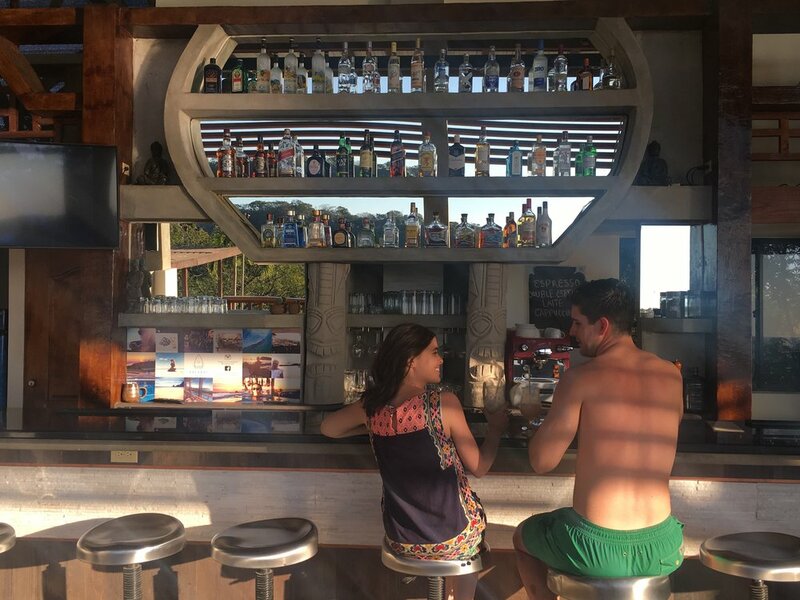 Despite what we had heard, we felt safe in Nicaragua the entire time. The people were incredibly warm and welcoming, and despite the high level of poverty there was a true sense of community and pride. Granada is beautiful with its colonial architecture and bright colors. We loved wandering the streets and shops while trying to stay cool. We visited in late January, Nicaragua's dry season, just before the oppressive summer heat arrives. Although even this Florida girl found the humid and hot air unrelenting—but nothing a few cold Toñas couldn't fix. Our first day in Granada started with a visit to the Iglesia de la Merced, a historic cathedral in the center of town. 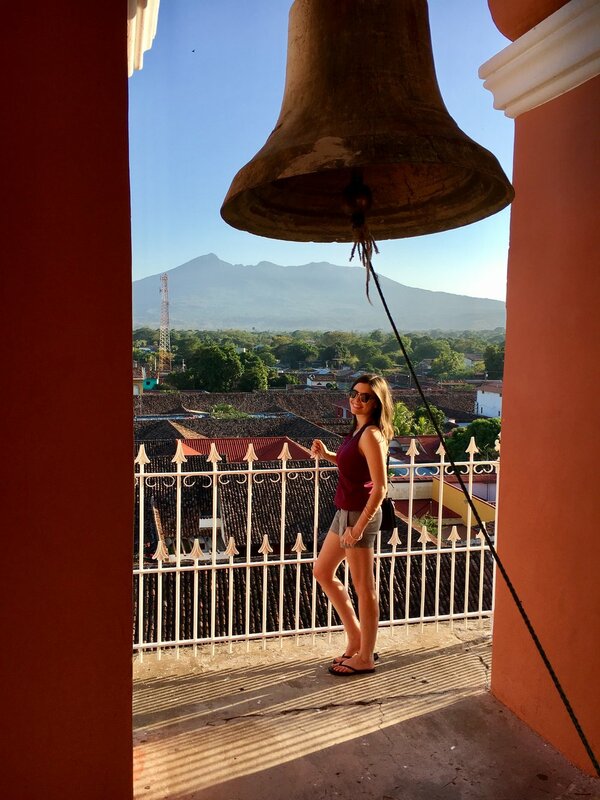 For a few cordobas the winding climb to the top of the bell tower provides a panoramic view of the city. 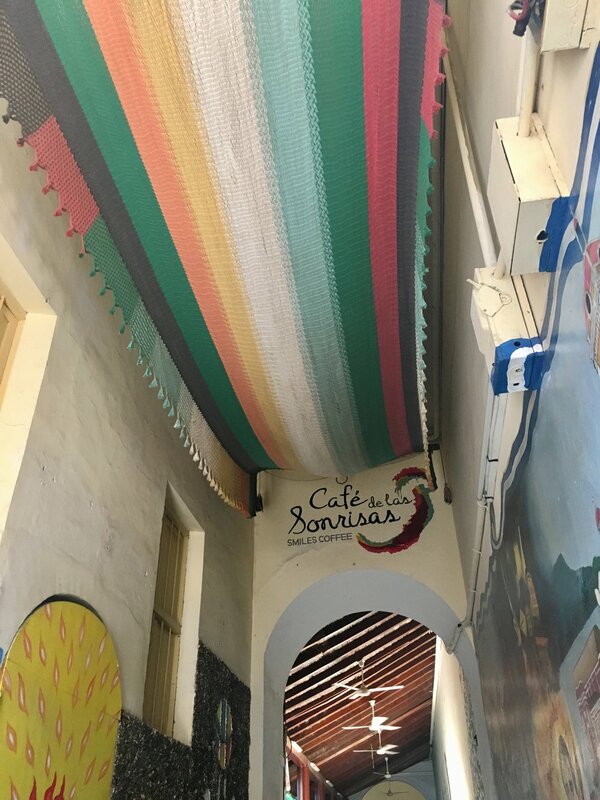 To me, the city felt very cosmopolitan, with a surprising amount of unique restaurants, museums, and galleries—many of which seemed to be influenced by the large expat community. After a few hours of exploring and wondering along Calle la Calzada, the heart of the city, Granada already felt familiar. We ate lunch at the most adorable restaurant, run by a Canadian couple, and I tried to dust off my rusty Spanish conversation skills. Afterwards we stopped for a local treat: fresh coconut at a roadside stand. After donuts and coffee at Allison's favorite spot, we drove two hours south to San Juan del Sur. The Nicaraguan countryside is incredibly gorgeous with its mountain, volcano, and lake views—I had trouble putting my camera down. We headed straight to the pool at HulaKai Hotel, which I had been looking forward to staying at for months. 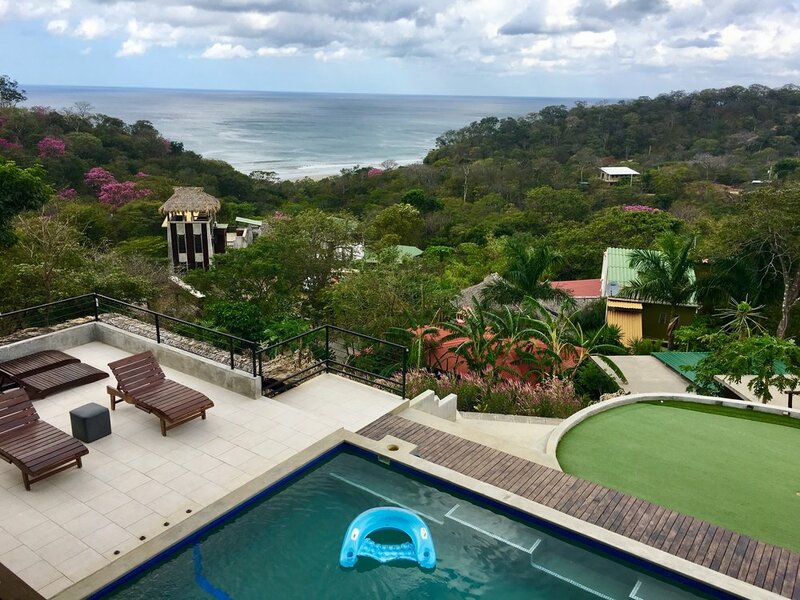 This secluded jungle paradise is such a special place with incredible views overlooking the surf break at Playa Maderas. The folks at HulaKai describe it as boutique hotel celebrating down to earth hospitality and a barefoot luxury lifestyle. The hotel offers a variety of rooms styles, simple by American standards, but beautifully appointed and surrounded by commual outdoor terrace space with hammocks and ocean views. I never wanted to leave. One of our favorite experiences was dinner our first night in San Juan. HulaKai hotel guests and neighbors from near and far gather together for a family style dinner several times a week to enjoy a freshly prepared, all you can eat meal. The menu is determined daily, with all ingredients locally sourced. It was such a fun experience to meet and talk with folks from all corners of world—some celebrating a special occasion, others visiting for the 2nd and 3rd time, any many for the first. HulaKai is not just a place you go to sip piña coladas on the beach, although we did that of course. You come here to unplug, reconnect, and catch your breath. 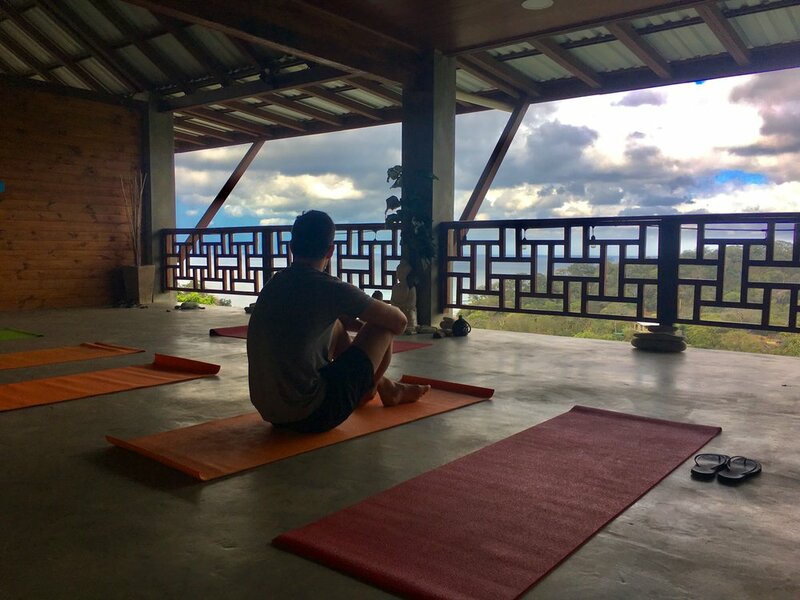 We started each day with chocolate chip banana pancakes and yoga, with a view that did not disappoint. 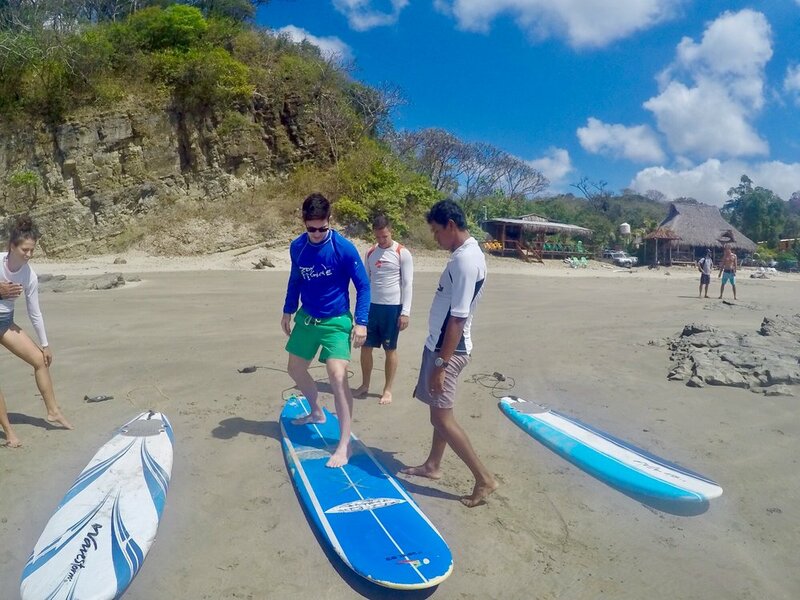 Up next was a bucket list item for us all—learning to surf! The front desk at HulaKai set us up with a local for a private lesson. We grabbed our boards, rash guard, and headed to the beach for surfing 101. As a former cheerleader/dancer, I like to think of myself as having above average balance. Lets just say my "above average balance" was no match for the Pacific Ocean. Our instructor, Juan Carlos, runs a small surf shop at the bottom of the hill just before the beach at Playa Maderas. He was fantastic and gave us a quick lesson on the sand before helping us all catch our first wave. It's hard, but so much fun, and addictive, always wanting to do better than the ride before. After A LOT of falls, we all managed to get up and had a ton of fun. We celebrated our surfing debut with more Toñas and tacos on the beach. 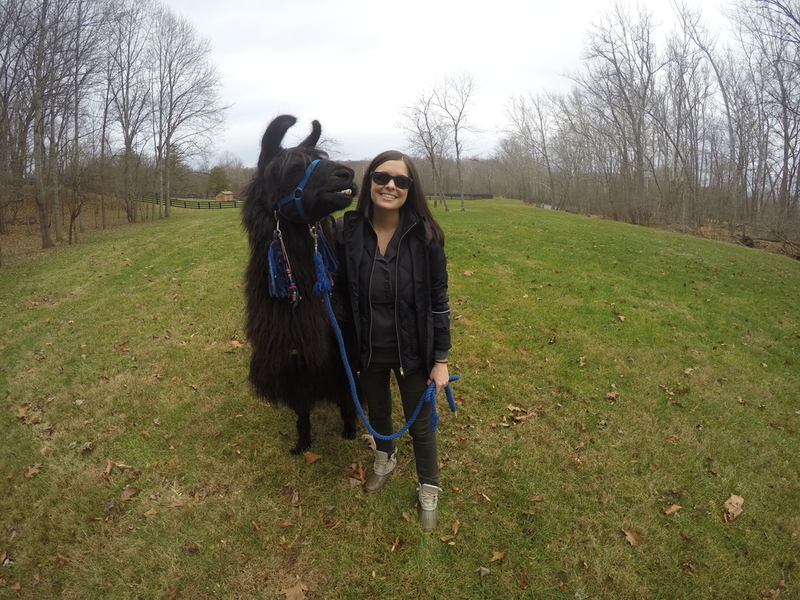 A vacation for me isn't complete without meeting an animal (or two, or three). San Juan did not disappoint, with adorable monkeys high in the treetops and the cutest community cats who call the hotels and shops home. 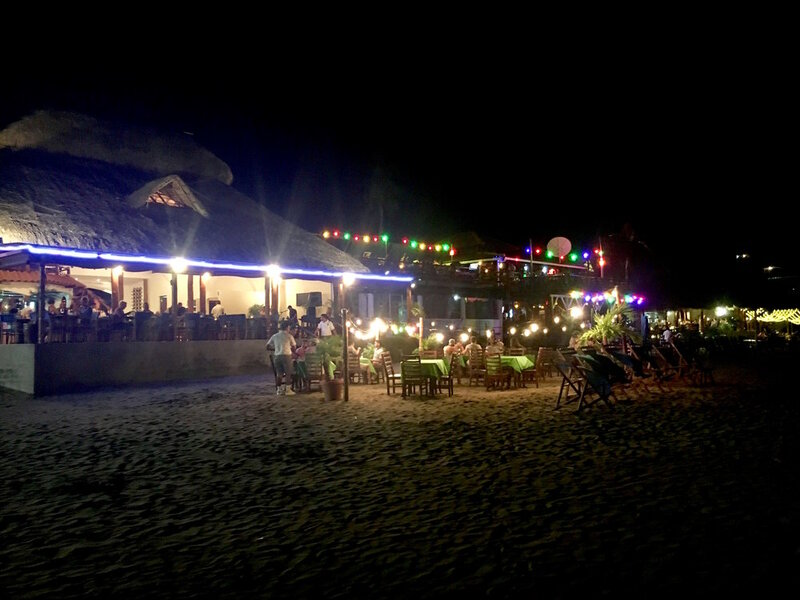 We headed to town one night and I was surprised to see what a bustling beach town it was. Tons of adorable shops, restaurants, and breweries. Definitely has a spring break vibe and were you go to have some fun. On our way out of town, we visited Christ of the Mercy, which sits high above San Juan del Sur and offers stunning views of the bay. Back in Granada, we stopped for lunch at Espressionista, a French-inspired cafe that had been on my list to visit. The decor and desserts were perfect. Tio Antonios’ Hammocks was another one of our favorite places. 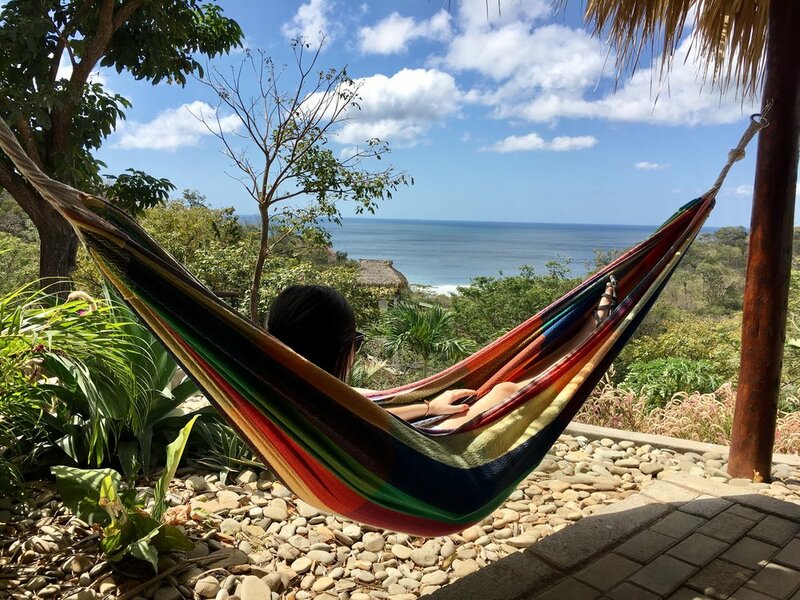 In addition to the most incredible hammocks, the owner is committed to employing and empowering people with disabilities, particularly the deaf community. It’s absolutely worth stopping in to visit and take a tour of their workshop, although be warned, you’ll have a hard time not bringing something home with you. We opted for the most adorable pet hammock. Soy Nica is another must visit shop while in Granada. Their handbag designs are simple, but colorful, and incredibly well made. I wanted everything. After some shopping we checked into Tribal Hotel, and oh my goodness. This boutique hotel, with just 7 rooms and a gorgeous courtyard pool, is a true oasis in the center of the city. The service, design, and attention to detail were top notch. I’ve truly never felt so content, and at peace in a space and absolutely will be coming back. That evening we made the trek to Masaya Volcano, one of Nicaragua’s active volcanos. There was already a long line of cars waiting to get into the national park, but seeing the red hot lava was certainly worth the wait—and a first for Adam and I. We wrapped up the week with a visit to the famous Masaya Market and day trip to Catarina to take in the gorgeous views of Laguna de Apoyo. At 200 meters deep, the Laguna fills a massive crater from an extinct volcano—so cool. My big win of the day was finding the perfect sandals, which I was able to have fit to size for less than $25 at Masaya Market, incredible. Our last full day in Nicaragua we took a boat tour around the isletas, hundreds of volcanic formed islands in Lake Nicaragua. We stopped for lunch on one of the islands and enjoyed the beautiful views and weather (and the monkies that call the islands home). Before heading to the airport we enjoyed a perfect morning at Tribal, with a multi-course breakfast and a final dip in the pool. We made the nine hour drive from Washington, DC to Nashville for the start of our 1,500 mile road trip through Tennessee and North Carolina. Our first stop, celebrating the wedding of our sweet friends from college. Their destination wedding was the perfect backdrop for exploring all that Music City has to offer. Neither Adam or I had been, although it has been at the top of our travel bucket-list for some time—and it certainly didn't disappoint. We so enjoyed celebrating with our college friends, Alexa and Chris, on their special day. With its open-air chapel, crystal chandeliers, and antique church pews, their ceremony and reception at Mint Springs Farm, just south of Nashville, was pure southern elegance. Country music is alive and well in Nashville, as are the herds of bachelorettes and birthday parties at every turn. Nashville is certainly the place to come for a good time and is well known for its storied music history, but I was most surprised to find a capitol city with a thriving food scene and eclectic vibe. My favorite place by far was the trendy Pinewood Social that came highly recommended. This restaurant, meets adult playground, is a funky, fun space with delicious food. Beyond the dining room and bar is a six-lane bowling alley, bocce court, coffee bar and outdoor pool. We were there for Saturday brunch and I honestly could have ordered everything on the menu. We opted to share the pork belly egg sandwich and chicken and biscuits—so good! Proper Bagel - Contemporary eatery on Belmont Boulevard. Patterson House - Sophisticated speakeasy on Division Street. Yazoo Brewing Company - One of Nashville's largest and most popular breweries. From the Country Music Hall of Fame to historic RCA Studio B, Nashville is packed with music must sees. We tried to hit the high notes on our quick 1-day tour. Another DC bucket list item complete! This weekend, Dani and I (finally) biked the Mount Vernon Trail, an 18-mile paved stretch between Rosslyn, Va. and George Washington's Mount Vernon Estate. Winding alongside the Potomac River, the trail offers runners, cyclists, and exercise novices alike a scenic escape from hectic city life. Although, on a nice day, we quickly learned the trail can get pretty crowded too. Thanks to a little GoPro magic, check out a small glimpse of the awesome scenery along the trail. Situated in Northern Virginia, the multi-use recreational trail is easily accessible by car or metro. There are some worthy stops along the way, including Old Town Alexandria, Arlington National Cemetery, Gravelly Point, and of course, Mount Vernon Estate, a must see. Don't have your own bike or just visiting? 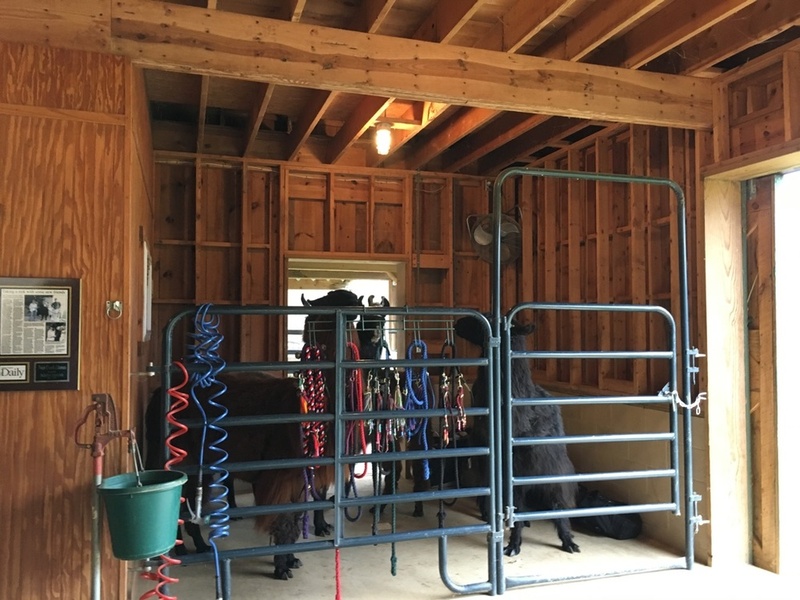 No problem, you can rent one from Bike and Roll in Old Town Alexandria and enjoy a scenic ten mile ride on the Mount Vernon Trail. And if the 20 mile round trip is a little too much, you can book a one-way bike trip and return to Alexandria on the Potomac Riverboat Company’s Miss Christin. I think that's next up on the DC bucket list!